June 27, 2017 update: The deployment did occur as scheduled on June 27, 2017. Photo taken on-site prior to deployment. The first deployment of a vessel on the new Manasquan Inlet Reef site, part of the NJDEP Division of Fish and Wildlife's Artificial Reef Program, is scheduled to take place on or close to Tuesday, June 27, weather and sea conditions permitting. The deployment will mark a momentous day for the reef program as this is only the second deployment on the new reef which was part of a compromise with the commercial industry to eliminate fixed gear from state reefs. The Mt. 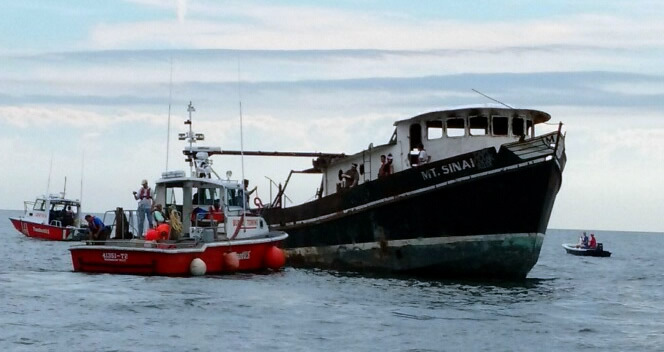 Sinai is an 87-foot trawler donated by Roy Diehl of Belford NJ and the Belford Fisherman's Cooperative. Towing and preparation expenses are being sponsored by the Greater Point Pleasant Charter Boat Association. The vessel will be deployed in 75 feet of water and will have an active lifespan of over 80 years providing habitat to more than 150 species of marine organisms. Occupancy of marine fish such as black sea bass will occur within days of the sinking; the ship will ultimately become home to other species such as tautog, summer flounder, scup, and lobsters. Around the wreck, anglers and divers can expect to find seasonal abundance of bluefish, scup, striped bass, and several other structure-oriented species. Individuals and groups interested in becoming part of the Artificial Reef Program should contact Peter Clarke, Artificial Reef Coordinator, at 609-748-2020.